I realise that my updates have slipped to Mondays in recent weeks. Often I’m too tired on Sunday after writing to stay up any later for a blog post. Monday makes for a better option, I think – less pressure on a Sunday to finish writing quickly. Anyway, in week 22 I wrote a total of 5,390 words, for an average of 770 per day. My total now stands at 97,270/1,000,000 words, or 9.73%. I am getting very close to that first one hundred thousand, the first ten percent – certainly within reach of hitting it in the next week. This is tremendous achievement. I have written more in the last 22 weeks than I did in the four years or so prior. For all that I’m quite impressed with myself for how much I’ve written in 22 weeks, this week’s work is perhaps less than impressive. The wordcount isn’t terrible, but having spent five days writing on Horrible Monster I feel like I could have done better. And I’m not too happy with what I wrote the other two days either. Spirit Doorway has potential as a concept, but I’m not happy with what I wrote for it. I was struggling to come up with anything to write, I was tired, and after exhausting my usual internet destinations for writing prompts I flicked through the book I was reading (Pagan Britain, Ronald Hutton) picking the first words on two pages opened at random (well, I opened about five pages, but on three of those pages the first words were things like “the” or “when”). Spirit and doorway were the words that came out, and I started writing and let the story form as I went. I tend to get quite bogged down, when I’ve got little idea of what I’m writing or where the story is going, with establishing the setting and world for what I’m writing. In this case it helped me produce the story idea, but ultimately it’s not writing that can be kept, it’s more a brainstorming or freewriting document. This was the case for Spirit Doorway, in its current version. I wrote a lot but said very little, and only barely got into any semblance of plot. But there is perhaps something there I can build on. The same can be said for The Sun Goes Out. This was inspired by a prompt on /r/writingprompts: “It has been five months since the sun suddenly disappeared. Wandering the wasteland and struggling to survive, you are the last remaining member of the human race. Or so you think, at least.” I placed my character in Iceland, since I figured geothermal power plus familiarity with winter conditions would mean people there would do better, and used radio communication pings as the element to indicate others are alive (In Stromness, because I’ve a weak spot for Orkney and was listening to Farewell to Stromness by Peter Maxwell Davies at the time). Again, though, I spent a lot of words getting to the point, and never actually finished the story. As for Horrible Monster, it’s filler. I’ve said already that I don’t see this story working. I’ve got individual scenes and sequences, even strings of scenes, that work within a flimsy framework, but it’s not really something that I see working as a whole novel. I wrote in that story because I needed to write something, and felt like indulging in the relationship between the two key characters that I love so much, but an indulgence it is, and can’t really be anything more. Not at the moment, anyway. In terms of working on Kell’s Adventures, I’ve made no progress this week whatsoever. I have not made notes about what I want from chapter 4. I haven’t started editing chapter 1. I haven’t even opened the Word file to reread chapter 1. I should. There’s definitely something in that story I like, and I know it’s going to take a lot of work to get into shape. I’ve had a busy week this week so writing has been something of an afterthought, writing so I don’t miss a day, because missing a day could be fatal to my challenge. I haven’t worked at it though, and I will need to work at it – a day or two to sit down and really focus on it. Maybe I’ll get time in the week to come, on Thursday and Friday. One thing I have done, though, is to think a little more about the Phoenix comic. 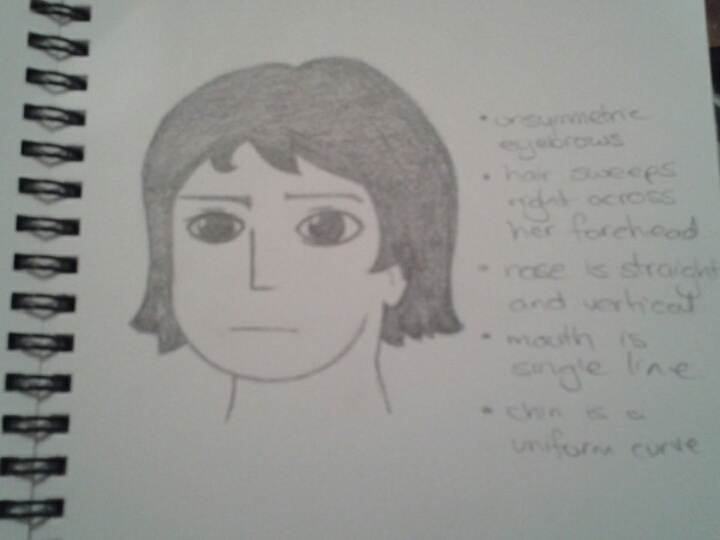 I’ve even done a few sketches, and settled on the facial design for the main character. I reread Understanding Comics by Scott McCloud, which I bought years ago when I was much more into comics (but never actually got more than a couple of pages into making them). It has inspired me and given me ideas and approaches to think about. The character face sketch I made last night. This is probably what my character will look like. But there’s a lot more to do too. Still, all steps on the journey of creating cool stuff. The problem at the moment is focus. I’ve got two major projects here: Kell’s Adventures and the Phoenix comic. Both will require significant time investment to reach some sort of completion. I care about both, feel confident about both, and either would make a good addition to my portfolio. But if I work on both at the same time, neither will get gone in a reasonable time frame. One will take time from the other, with the result that I could be well into 2016 with very little to show for my work in the final quarter of this year or the first quarter of 2016. It’s a hard decision to make. If I decide to pursue Kell’s Adventures, I have no idea when it’ll end. I see it as a serial, where each chapter can stand alone – there is no ultimate goal, no specific climax the early chapters are all building up towards. I could go for a hundred chapters, two hundred – or it could end after seven. It’s a fun story to write, with characters which have potenial, set in a world full of unexpected elements. Each chapter having a different plot gives me huge potential for exploring that world, its people and cultures, its magic, its geography. If I focus on it, I might soon have it ready to post. On the other hand, the Phoenix comic has a clear end point. It’ll be ten pages, maybe one or two more. There’s a lot of time investment in drawing it, inking, colouring, but once those ten or so pages are complete, that’s the end of the project and I can dedicate all of my time to the next project – whether that’s Kell’s Adventures or something else entirely. And it will give me the artistic and graphic layout practice that would stand me in good stead for adapting the Mountain Story for the comic medium too. The problem is that the Phoenix comic could take me five or six months to produce, and having produced it I’d only have ten pages to show for it.